“Raven and the Wolf” from Christian Faith Publishing author Kathy Love Cowen is a beautiful novel about Cherokee culture, following young Chewahnih Walkingstick, a twenty-summers-old Cherokee maiden in the nineteenth century, who flees her ravaged settlement and heads south to escape the brutal Oklahoma territory snows, aided through the wilderness by the Raven and the Wolf, the guiding spirits of her dead parents. “Raven and the Wolf”: a vibrant Native American coming-of-age novel. 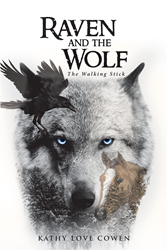 “Raven and the Wolf” is the creation of published author Kathy Love Cowen, author of the Walking Stick series and animal lover. She and her husband currently live in Texas; she has Native American heritage and is mother to a Purple Heart veteran of two wars. Cowen writes, “All Cherokees believe they are one with nature. ‘Children of the Sun’ as they are sometimes called. Tonight, Chewahnih would call upon the spirits to keep her safe, and in the morning, she would ‘go to water,’ partaking in the ancient ritual her people used to rinse their fears and heal their thoughts. The water ceremony would guide her way. Alone and afraid, she had never needed it more. Published by Christian Faith Publishing, Kathy Love Cowen’s new book is an enthralling adventure and romance novel that celebrates the strength of Cherokee culture, and one young girl’s journey to grow into her own. The novel serves as a delightful introduction to the Cherokee ways and legends, complete with a glossary and a narrative that brings readers into deeper connection with nature. View a synopsis of “Raven and the Wolf” on YouTube. Consumers can purchase “Raven and the Wolf” at traditional brick & mortar bookstores, or online at Amazon.com, Apple iTunes store, or Barnes and Noble. For additional information or inquiries about “Raven and the Wolf”, contact the Christian Faith Publishing media department at 866-554-0919.